The rest of my Thanksgiving preparations went really well. And what I really mean to say is… after the debacle that was my pumpkin pie baking Wednesday night, I managed to cook everything else perfectly. Okay, let me tell you what happened! Remember how I tested pies ALL MONTH until I came up with the perfect pie recipe? Well, I screwed up when I doubled the recipe, and didn’t put the right amount of pumpkin in, and in the second batch, forgot the salt to boot! (I’m good at math, it was just a stupid mistake!) I didn’t realize it until was adding the doubling instructions to my recipe that I had goofed! Then I tried not to lose my mind. We tasted pieces from both of the batches, and they were still good. They still tasted like pumpkin pie, they just weren’t as good, so I was a bit disappointed in myself, especially after all that hard work! I did have half of my perfect pie left from the night before, so I served that one first. The one I made crustless was a success, however. I added that info to the recipe post too. Everything else came out great. 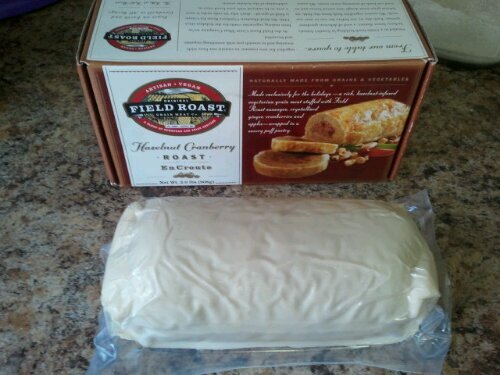 The Field Roast Hazelnut Cranberry Roast en Croute was a nice addition to the meal. Both of my parents really enjoyed it and so did we. 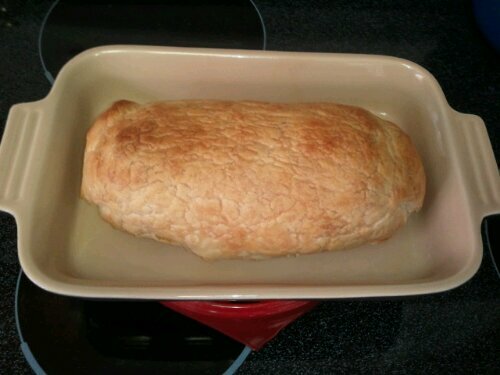 I was still glad I made the Tofurky though, because the field roast was more like a pastry wrapped sausage. The Tofurky filled the turkey void, and even made the house smell like Thanksgiving, according to Thomas : ) More people might have tried my fake meats had my aunt not shooed them away by saying, “that’s made from tofu, you won’t like that!” It was actually seitan, but I didn’t feel like getting into it. More delicious fake meat for me! Out of the oven! 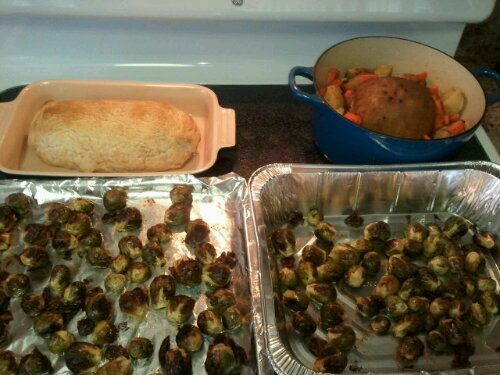 I misted both the pan & the roast with a little olive oil before baking. The brussel sprouts were a big hit even though they got a bit overdone from being reheated at my mom’s sans foil, too close to the element. No one seemed to notice. As an aside, I did think that the medium sized ones, halved, that I used for my pre-Thanksgiving trial dinner had a better texture than these mini ones left whole. 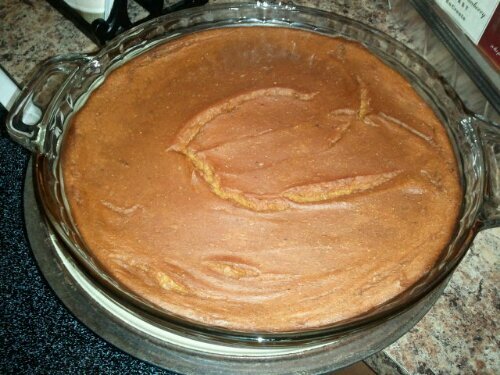 Here's a pic of the crustless pumpkin pie I made. I lightly greased the pie plate with some oil on a paper towel and poured in the filling. It actually sliced and served surprisingly well, and only 101 calories and 0.8g fat! This was actually a picture of my breakfast plate, the next day! 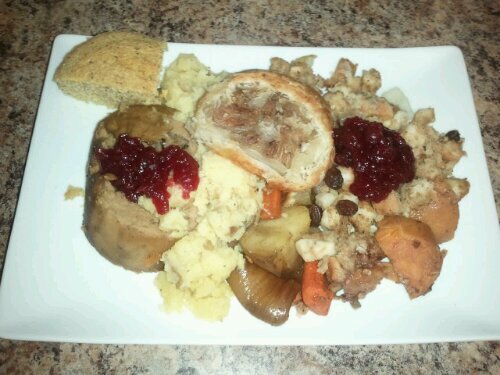 Ah, the beauty of leftovers. This was brunch the next day. Cornbread, Tofurky and roasted veggies, mashed potatoes, field roast, stuffing, cranberry sauce and sweet potatoes with pecan topping. SO GOOD! The only non-vegan dishes that were served ended up being the ones my aunt brought, which were turkey, green bean casserole and squash. So I had plenty to eat. She did take home a pie though, and texted me later that it was delicious. I only wish I had been able to send everyone off with the correct version of the recipe, but hey, there’s always next year! Hope you and yours had a great one! I have one of those Field Roasts set aside for Christmas… I can hardly wait! I’m still trying to track down a Tofurky. Trader Joes didn’t have any last time I checked. Your Thanksgiving looked delicious!